The investigation into the 25 January 2010 crash of the Ethiopian Airlines is still in the early stages, with searchers still looking for wreckage and victims. While there has been no formal announcement of the death toll by the investigating authorities, no survivors have been found in the two days since the crash. 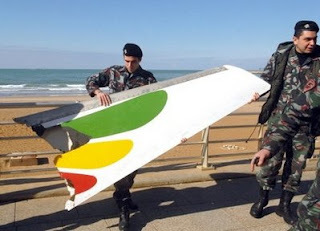 Most of the aircraft wreckage, including the cockpit voice recorder and flight data recorder (black boxes) is on the seabed just off the coast has not been recovered. On the 27th, several media outlets, including Ethnomedia.com, reported that at least one of the black boxes was located in about 500 feet of water, and that recovery would be attempted. The American naval vessel USS Rampage was assisting in this effort. 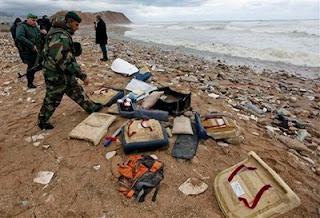 The aircraft crashed into the sea about 6 km past the end of runway 21, about 3.5 km from the village of Naameh. According to the departure procedures for that runway, the airplane was supposed to have turned right due to high terrain east and south of the airport. Several media outlets also reported that the aircraft failed to follow air traffic control instructions after takeoff or that witnesses reported seeing the aircraft in flames before it struck the surface of the water. None of these reports have been confirmed by part of the Lebanese government that is tasked with investigating this event. Below is an AP report on the early results of the investigation, including wreckage recovery.